It’s raining, and so, in addition to baking, watching football, and drinking beer, I am going through old e-mails and photos. 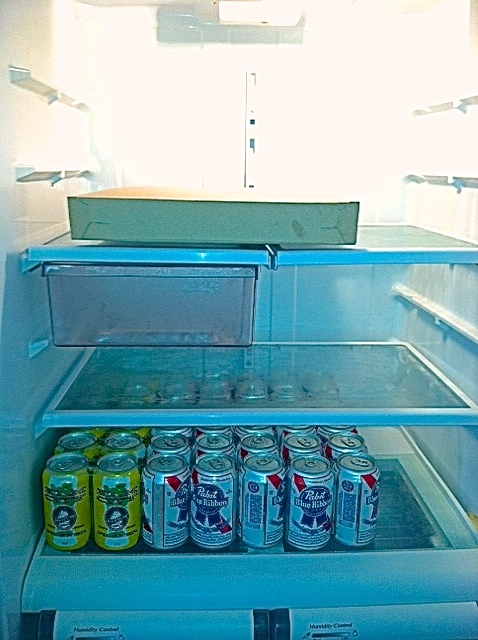 Found this one of our fridge from when we first moved into our new apartment. Pizza? Check. Beer? Oh yes. Fabulous. 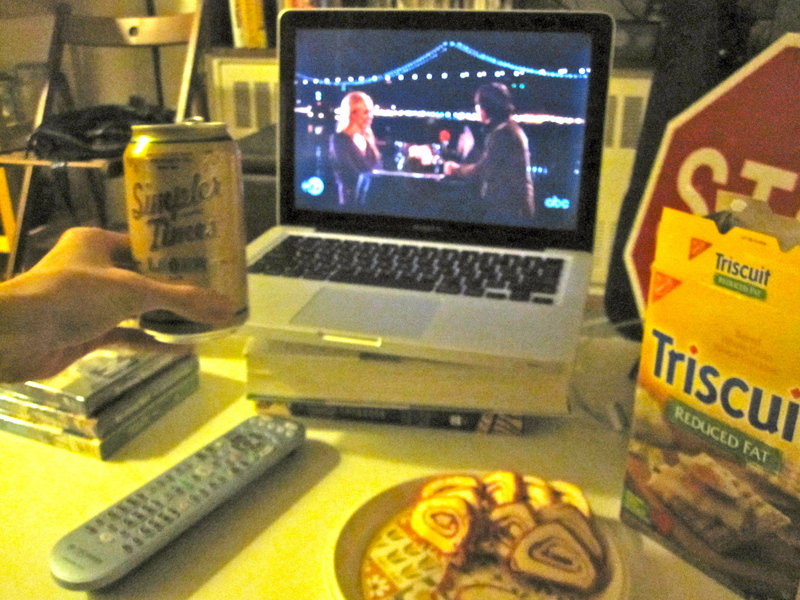 Beer, snacks and, yes, The Bachelor. My friend posted about this stuff on Facebook and, though I’ve never heard about it before, I knew I had to get some. Immediately. Not only am I completely enraged with my friend for making me aware of this goodness, but I am considering suing Trader Joe’s for the near-lethal quantity I have been consuming. 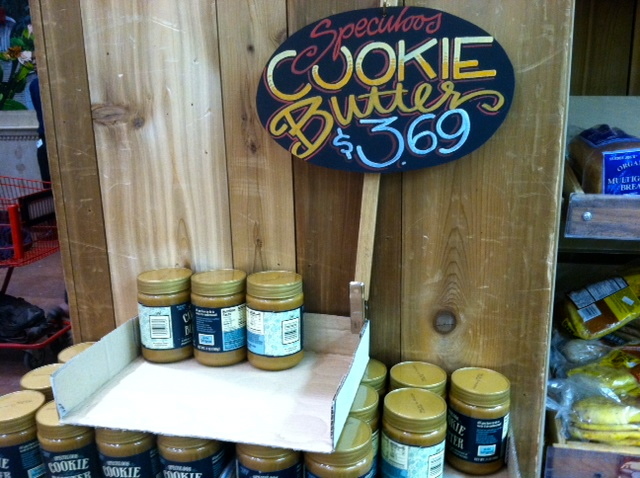 Cookie butter is the quintessential “eating in your underwear” food. I spoon this stuff down my throat, straight from the jar, in my underwear. I do not eat it in front of anyone. Here we have a mostly eaten package of taco-flavored shredded cheese, two hot dogs, jelly, mustard, and a Domino’s…coupon. Remind you of anyone? It’s obvious now more than ever that we share the same bloodline. I wonder if he eats this stuff in his underwear. I doubt he eats anything in his underwear. In fact, I doubt he even eats. 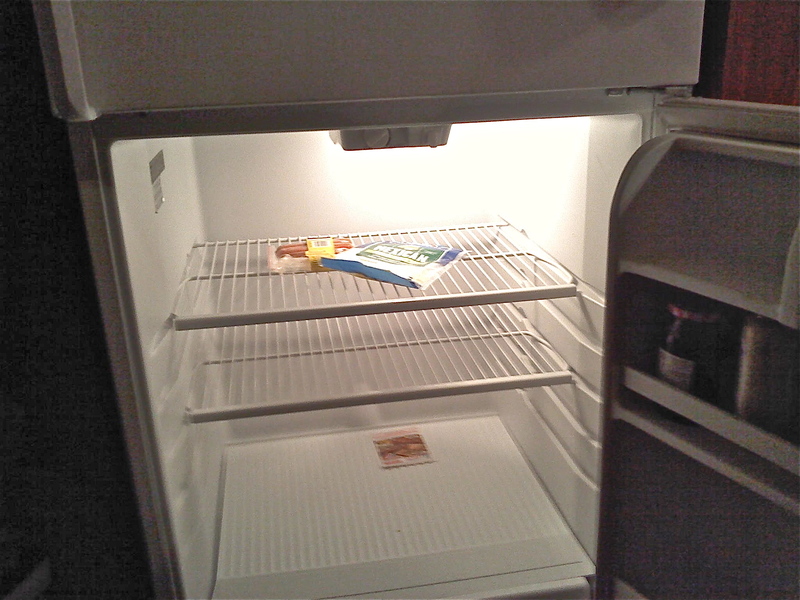 In this sad refrigerator, you will find water, cereal, soy sauce, salad dressing, sun-dried tomatoes, soyaki sauce, raisins and, of course, baking soda. 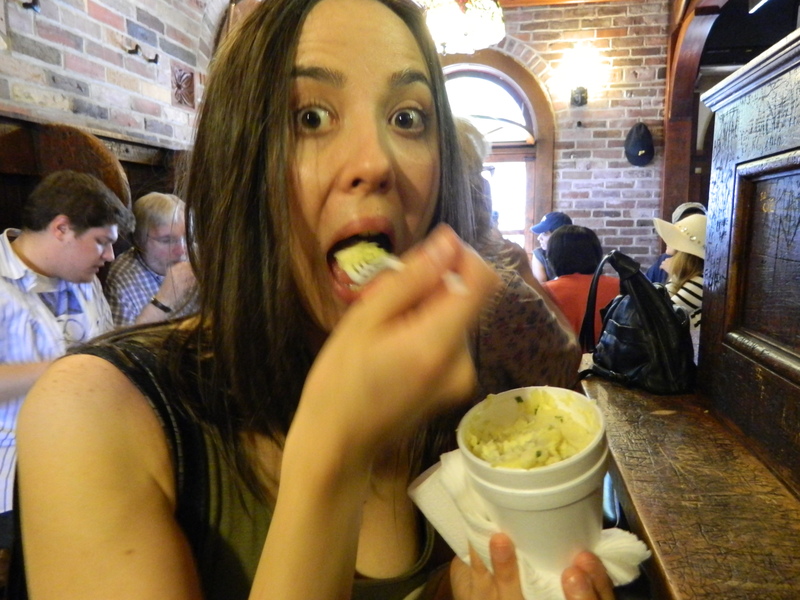 She also revealed to me that she enjoys eating bread with gobs of butter in her underwear. Thanks for the photo! After escaping to the suburbs for the weekend, I came home to this. 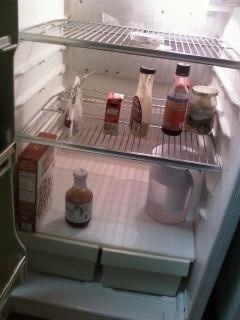 It’s always a surprise to remember how I left things, but this was just too pathetic not to share. Let’s all be aware that we are looking at baking soda, which my mom insisted I purchase and replace every 30 days (that same box has been there for nearly two years); a mostly empty, flat ginger ale, used two weeks ago for whiskey cocktails; two on-their-way-out lemons; and a bit of feta cheese. 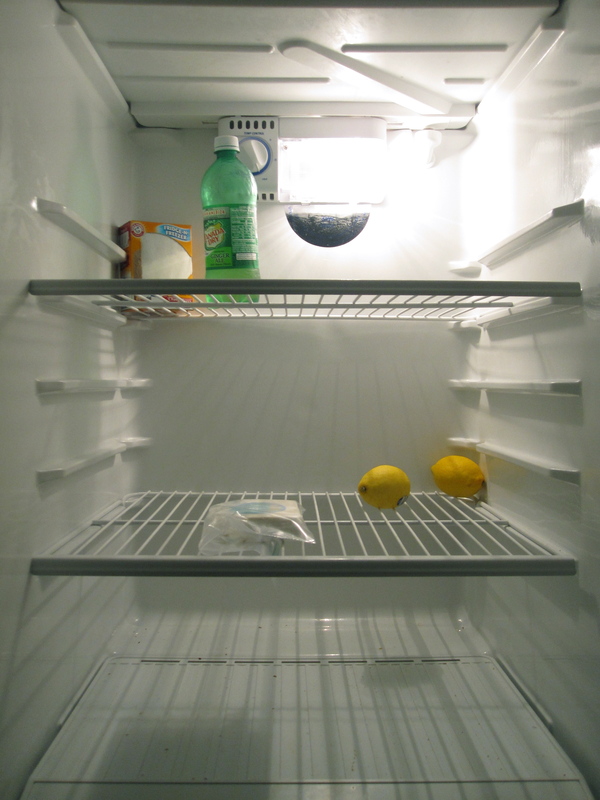 Do you have something (or nothing) in your refrigerator that is worth exposing? E-mail your photos and perhaps it’ll get featured on the old blog.